The new CNGE2+2SMS from ComNet allows installers to build an IP Surveillance network without mastering complex programming knowledge. The switch aids setup and eliminates programming – no laptop required, avoiding the cost of managed switches and reportedly around 50 to 75% faster to install than a traditional managed switch. Weighing 200 grams and measuring 10.4 × 9.4 × 3.7 cm, the CNGE2+2SMS is ideal for use in confined spaces. 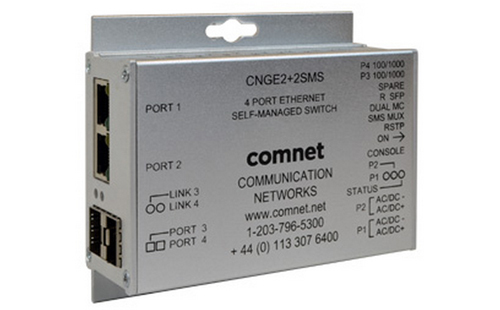 In detail, the CNGE2+2SMS is a four port intelligent switch with light management functionality. It provides two 10/100/1000Base-T(X) copper ports and two 100/1000Base-FX SFP ports. The system provides functionality for easy field deployment including DIP switch based operation of RSTP for creating redundant network topologies as well as preventing network video flooding of multicast traffic when used in a linear or star topology. Ports 1 and 2 can optionally supply up to thirty (30) watts of power per port based on the IEEE 802.3at standard. An optional High Output (HO) version is also available that can supply up to sixty (60) watts of PoE from ports 1 and 2. This product is compatible with the ComNet Copperline SFP modules for operation over extended distance UTP or Coax cable.